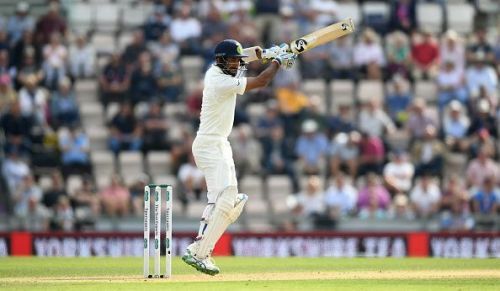 Cheteshwar Pujara displayed grit and determination in Southampton Test against the hostile English bowling and scored a brilliant century to rescue India in the first innings. His grinding innings of unbeaten 132 runs and batting effort with the tailenders helped him return to form. It was his first Test century in England. Pujara is often compared to the legend Rahul Dravid for his concentration and batting style. He manifested the same in the first innings of Southampton Test. He displayed the mix of defense and attack and played his strokes whole-heartedly. He played cut strokes with perfection to counter the outswings and left the balls that were needless to play. He walked on to bat when Lokesh Rahul perished to Stuart Broad at the score of 37. He held on to one end while wickets at the other kept falling. He constructed a vital and a much-needed partnership of 92 runs with Virat Kohli before Indian captain edged one in slips. Witnessing a constant fall of wickets at the other end, he started playing his strokes and scored on every possible opportunity. He scored his maiden Test century in England and possibly recaptured his form in international cricket. Above all, it was the timing of the innings that stood out. His century helped India to stretch a marginal lead over England and keep the contest alive. We often blame that the great players take away all the attention and the limelight from the other players. But, they also take away the pressure. Before walking in this Test series, everyone's focus was on Virat Kohli and there were hardly any talks about Pujara's desolate form. Pujara himself had a miserable tour to England in 2014 but still, the world was busy discussing Kohli's prospects in this series. Before the start of the series, he had a miserable season of county cricket earlier this year(2018) with Yorkshire. In six county matches, he could score 174 runs at below par average of 14.33. He also had a dismal outing in the Test series in South Africa earlier this year. He could only score 100 runs in 6 innings of 3 Test matches at a poor average of 16.66. On his last tour to England in 2014, Pujara had only managed 222 runs in 10 innings of 5 Test matches at an average of 22.2. He had not scored a century overseas since his last in Johannesburg in 2013. However, he was determined to do better in English conditions and for that matter, he had headed towards county cricket soon after the series. In his first season in English county in 2015, he scored 264 for Yorkshire at an average of 52.8. He once again signed the contract with Yorkshire earlier this year after representing Derbyshire and Nottinghamshire in the previous years. Despite his slumped season with Yorkshire earlier this year, he was confident of performing well in upcoming series against England. After suffering a slump in the form for long, it was almost a do-or-die series for Cheteshwar Pujara. However, he seemed to have reinvented his form on this tour and was able to score his second overseas century since 2013. In 5 innings so far on this tour, he has scored 236 at an average of 59. He seemed to have benefited from the county cricket and has taken forward that confidence in the series. He looked in extreme control with bat and was able to manifest the same over his mind as well. His stout-hearted hundred at Ageas Bowl in Southampton is surely a result of his experience playing county cricket. With three more innings to go on this tour, we can expect few more kncoks of that sort from him.